This is the Third in a series about nine clients and friends who successfully transitioned or transformed their careers after age 50. This month I will describe how a good friend (and my former eighth grade English teacher) shifted from thirty years as a corporate executive to a small business owner at age 60. The graphic above illustrates the degree of difficulty and the economic considerations for the new venture option. 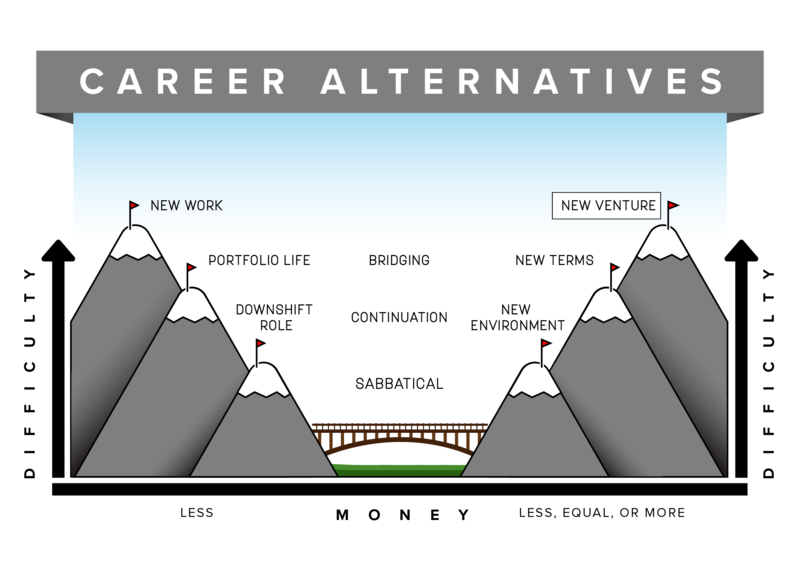 This career alternative involves starting a consulting practice, buying or starting a business or buying a franchise. 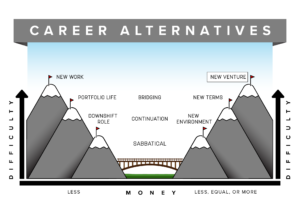 In my January, February and March blogs archived on my website, I described each of the nine career alternatives, with corresponding strategies, economic considerations and degrees of difficulty. Please refer back to these three blogs as you prepare for your own career transition or transformation. Mike describes himself as a “child of the 1960s,” which he says were also his “wilderness years” where lifelong values and beliefs became rooted. After graduating from high school, he first attended Amherst College, then graduated from the University of California, Berkeley, in 1964, majoring in English literature. Mike next taught high school English at Breck School in Minneapolis, and, for one memorable year, at Punahou School in Honolulu, Hawaii. After marrying in 1968, he and his wife lived for a year in Sydney, Australia, finally completing their around-the-world adventure with a nine-week bus trip from Katmandu, Nepal to London. Returning to Minneapolis, Mike was an advertising copywriter for a few years before receiving his MBA in marketing, and spending 30 years in general management with two Fortune 500 firms, first in marketing roles at General Mills, then as a General Manager at Land O Lakes. Taking early retirement, Mike bought a small business in 2002, where he remains active. The idea of buying a business came from his 25 year old son who had just completed a computer science degree. Mike’s daughter found the company in the “companies for sale” section of the newspaper. His company of nine employees provides IT support for small businesses, with 35+ clients, which has grown from two (Mike and his son) to nine employees. During this period, he and his wife have moved from the suburbs to a condo on the Mississippi River in downtown Minneapolis, remained close to their two children who live in Edina, and become the happy grandparents to three boys ages ten, eleven, and thirteen. Mike is active in the downtown Minneapolis community, but has been very much challenged by the trials and tribulations of starting and growing his business, where his son is the president and daughter the general manager. Beginning in the year 2002, no longer surrounded by all the support services that are part and parcel of any Fortune 500 company, Mike found himself, with his son, directly putting on all the hats associated with any business, many of which, he says, didn’t initially fit very well…such as making literally thousands of cold calls to attempt soliciting new customers, consuming enough coffee at networking encounters to fill a small sized swimming pool, and personally chasing down and confronting slow (or no) paying clients. On the more personal lifestyle side, he has been involved with a downtown men’s group, as one of six founding members that has grown to an organization of over 60 individuals, almost all of whom have moved past their permanent career years. Some people might describe Mike as an individual who appears to have been driven, compulsively seeking change. He changed colleges, experimented with a variety of vocations before settling on business general management, took on the challenges of not only starting a new business, but doing so with his son and daughter, changed from suburban to urban living, took up an entire new set of friends and acquaintances once moving downtown, spent a year active in a Zen Buddhist community. Mike has also been involved with Zero Population Growth (ZPG), the Sierra Club, and in the last three years, weekly Toastmasters meetings, spent 10 years writing and publishing a novel-again, perhaps almost driven, compulsive behavior. Well into his thirties he battled with family depression and anxiety, with which he for a time successfully coped with, again, compulsive early school achievement. “But it all fell apart when I hit college,” he says. “I was no longer a super star, a big fish in a small pound.” It took almost ten years to rebuild his life, which he did through therapy, medication, his wife’s invaluable help, a series of life “experiments”, and the inevitable hard lessons that come with operating in the everyday real world. Specifically, during his MBA experience, he was told that if he possessed one important skill, it was the ability to take vast amounts of information and condense it into 25 words or less, bumper sticker style. He says that this allowed him for 30 years to move up the ranks of general management by being able to successfully write endless annual and long-range business plans, sell dozens of very large investment projects to management and the company’s board, and make hundreds of sales and customer presentations. At age 60, however, he transitioned abruptly from a work centric to a family centric world. All his energy and job dedication now focused on his wife, children, and grandchildren. He says that he is not aware of a single member of his men’s group who does not say that, in one’s final years, nothing is more important than one’s family! Stories help us understand the realities, struggles and triumphs of life and work. Mike has shared his story in the hope that you will see greater possibilities for yourself and others. Join me next time, as I explore another path of career transition and transformation after 50.